Online shop is live, order now! I love cooking ! But I like to keep it minimal, to leave the food as much as possible in its raw, unadulterated form for maximum benefits! Overcooking and overprocessing depletes food of its nutritional value, especially of antioxidants and vitamins which are so unstable! 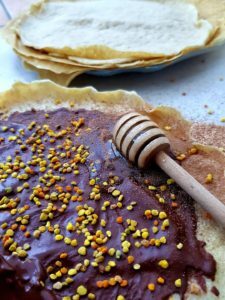 That’s why I opted for a raw (chocolate) filling for the crepes, to keep all the polyphenols value of the raw cacao and the endless array of the bee pollen’s nutrients alive to maintain health and wellness for longer ! Mix the crepes ingredients until a smooth, thin consistency forms. Grease a non-stick pan over medium heat with coconut oil. Pour about 1/4 cup (60 mL) of batter into pan. Cook the crepes for 1 minute on each side until lightly golden. Repeat with remaining batter, adding oil as/if needed. 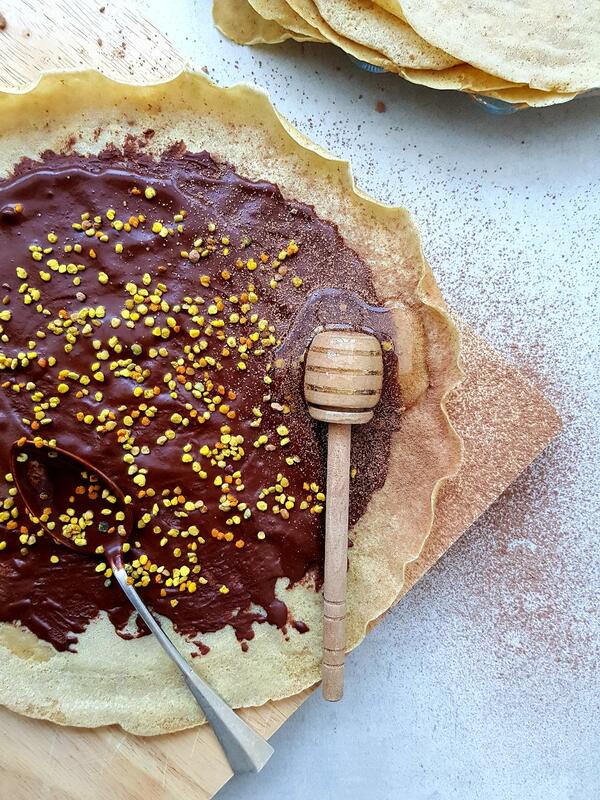 Mix the almond milk with cacao powder, cinnamon, raw bee pollen and raw honey to make the velvety filling and spread onto the crepes ! Top them up with raw bee pollen and start rolling!